Well, coming to the story, we found out that it is a mixture of history and fantasy genre. After some chapters you may adrift to the fantasy world of Anshul which he conjures up like a champion while cleverly underplaying the king Ashok. The novel opens with the battlefield of Kalinga – it is all about heaps of corpses and the ambience is of death. It is a point of utter shock and realization for the king Ashok. However, in the battlefield all seemed to have died. The king Ashok is repenting his actions, the bloodshed and surmounting dead bodies thwart his heart from within, and he decides to end his lust for winning territories one after another. Well, from the dead-inflicting battlefield of Kalinga emerges one strong soul. He is Amartya. Despite losing his wife and a child and both of his arms and one eye, surprisingly he is still alive and full of revenge towards Ashok. He refuses to take the help from Ashok, who in much contrition tries to help and resurrect the people of Kalinga. Though he is happy to find his younger brother Vatsal safe and alive but to seek revenge from Ashok he moves on to a mysterious place called Mayong. It is a very different place, full of magic and other tantrums; in fact from here onwards the novel gets totally into the skins of fantasy. The less you say about this place, the safer you feel. This place proves a kind of wonderland for Amartya – he not only regains a full body but also learns something terrific that he becomes immortal. However, little did he know that he has no control over his mind? Killing and bloodshed becomes a daily routine for him. The people of this village – Mayong – are not common folk. As a matter of fact they carry many secrets with them, stored at their homes. On the other hand, there are some people looking to get all those secret-carrying documents into their hands, including a bunch of Chinese people, who attack the locals with their fire-spitting dragons. So, who’s going to stop them or will they trample everyone and get away with the secrets as high as having access to immortality. That’s the start of suspense, more to come throughout the novel. 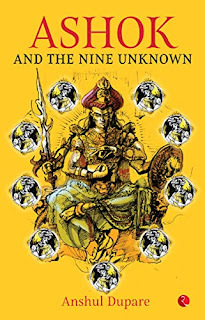 Around the same time, in the kingdom of Ashok, he forms a team of nine intelligent people from the field of Alchemy, Gravitation, Light, Sociology, Physiology, and so on. The ultimate aim of Ashok is to preserve the resources and technology that are used in wars. Ashok forms the team of Nine Unknown to save the humanity from the wrath of wars. But the question is, has he chosen the right people for the right job, even so how will he test their mettle? You may be surprised to know that one of the team members is Vatsal, brother of Amartya. Though it is a 224 page novel, but it reads like a saga. To make it a gripping fantasy, the author has made the storyline and characters shuttle between various locations, like Egypt, Mayong, Patliputra and of course Kalinga. The novel is full of events and twists, which alone makes it a fantastic read. You will be thrown up for a loop when you discover that the main storyline has much to Atlanteans and the statue of The Sphinx located in Egypt may give an unexpected suspense element to the overall story. Is it going to be good vs. evil or the theory of one land? May be, may be not! Give it a try and you, for sure, will not return disappointed. Will the Nine Unknown succeed in their mission? What will happen to Ashok and Amartya – will they come face-to-face for the final fight? What’s that Atlantean connection? By now you must be raging with inquisitiveness, well grab the copy as soon as possible, and find out yourself.